The following are links about Jail you may find interesting. Also check out the other pages. The following are comments left about Jail from site visitors such as yourself. They are not spell checked or reviewed for accuracy. I am almost sure that the Jail was located at the corner of Summer and Central st. The main post office is now on one corner and the is a hotel/Motel where the Jail was. Plummly Village and treat me Donut shop is in the same area. This jail was on Summer St. I remember going there on a tour either from the church group or school. It was on a hilly slope as shown and, if you were to leave Union Station and go down Summer St, the jail was on the right hand side of the street. I remember walking past this jail many times when I was a boy. It was located on the land that is currently Aku Aku Restaurant and Hampton Inn on the corner of Summer and East Central Streets. It bordered the neighborhood that contained such streets as Arch St., Fountain Street, Orchard St., Clayton St., and Prospect St. Most of these streets were lost with the construction of Plumley Village. The building was demolished in 1975. I grew up in Plumley Village; 1 Prospect Street. The jail was directly across the street from my apartment, on the corner of Prospect and Summer streets. I remember watching an inmate push out the bars, use sheets as rope to climb down and onto a building behind the 12-15 foot wall going alongside Prospect Street. From there he jumped onto the wall and climbed down to freedom. His shirt still showed the dark numbers, and my friend, Larry Hughes, suggested he turn his shirt inside out, which he did. I have many,many,many memories of this building:watching inmates escape,watching them getting caught and beaten,touring when it closed,watching it get demolished and seeing the rats and bats fleeing,taking copper wire from the inside to turn into salvage (older kids climbed roofs and took the copper),bonfires which caused swat teams to disperse us. Fond,fond, memories indeed. I found an old book dated 1931, "Old Landmarks and Historic Spots of Worcester Massachusetts" that mentions there were 4 jails. The first was up Lincoln St just above the square and was erected in 1733. It was made of white oak timber and the first jailer was named Luke Brown. The second jail (1753) stood at the corner of Summer St at Lincoln Square. It also was made of wood. Notable persons confined were Mrs spooner, the daughter of Brigadier General Ruggles of Hardwick, a prominant man of the county. She, and 3 cronies were convicted of killing her husband. She was later hanged in Washington Square at what is now the Union Station. During the Revolution, this jail held many British prisoners and Tories. The 3d jail (1788) was erected on the same site and was made of Granite. The most noteable person confined was Timothy Bigelow, the village blacksmith who was a leader of the minutemen. He was confined for debt incurred because of the war and died in jail in 1790. The 4th jail is the one shown above. It was built in 1835. After completion, the 3d jail was torn down. Hangings were conducted at the new jail and continued until 1876. The book author mentions that the last rope used is still on display in the jail (1931). The last Worcester jail was on the corner of Summer and east central street, across from where the post office is now. 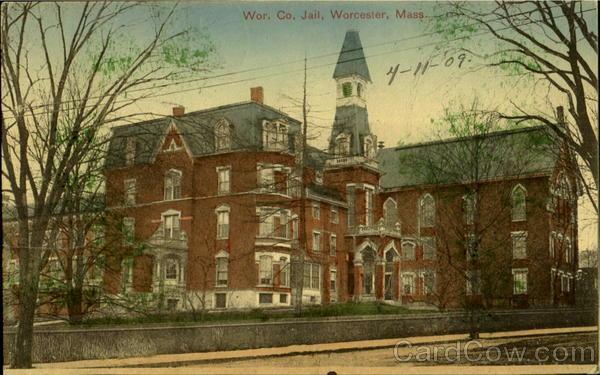 The address of the Old Worcester County Jail was 116 Summer St. Where the Post office is now at Central & Summer was the Insane Hospital back in the mid to late 1800s. If you were going south on I-290 you could look down into the Jails exercise yard. The picture shown here is a 1907 Post Cards. The jail had 3 sections Females in the South Block, Waiting trial was North Block & sentenced East Block. Up to the 1970s when it closed it was the oldest opperating jail in the country. Inmates were still using Honey Buckets as the were know for toilets up till it closed. The message below the main picture states: "I'm not sure where this used to be, the police station is the only real jail in Worcester now. "...The Worcester Police Station isn't the only jail in Worcester. The Worcester County House of Correction, Sheriff's Dept. is in Worcester/West Boylston. I just thought I'd give you this little bit of information to add to your site. Other than that I'd like to comment on your site. It is a great site and I visit it often. I was wondering if it wasn't too much of a bother if you could reply with any other information concerning literature about Worcester in the past. 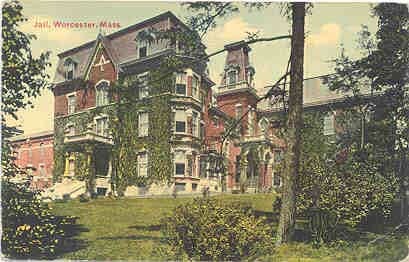 (specifically the worcester state mental hosp. aka bloomingdale insane asylum) I am especially interested and intrigued by this facility and I visit it's remains frequently...Thank you very much!! I used to live acrossed the street from this jail and I too remember escapes. You could see the jail court yard from our window. I was living there at the time they demolished it but I had a chance to see the inside before they did. I seen the poor conditions of the cells and I seen the Wardens office. We found old helments that all long gone now. I grew up on the county farm in West Boylston. My father was the Deputy Master/Special Sheriff during the time the Jain & HofC was relocated to West Boylston in 1973/74. I used to play in various areas of the old jail. I am currently researching the history of the Worcester County Sheriff's Office. I can be contacted at kflynn1228@charter.net if you have any info I might be interested in. I used to go to the jail when I was a very small child. We knew it as 'The Residence'. We mostly had family parties in the upstairs portion of the jail. It's location is where the old Aku Aku restaurant was - now there is a Picadilly Pub at that location. My dad was a worcester police officer in the 60s. One day while out running errands he had to go to jail. I'll never forget that day, as we we given a look inside. The jail guard pulled away this huge canvas wall and inside were the cells. The prisoners were yelling and calling us to come in. The guard then asked my father " have these boys been good?" The look on our faces must have been priceless, because the memory is. I can remember begging our dad leave and go home. Also do you remember the jails farm truck that was filled with prisoners They would commute to the farm during the spring and summer. I grew up after the on 1 Prospect Street after the jail had closed, and before they put up the hotel and restaurant in that lot. A bunch of us from the neighborhood played football in that lot on the weekends. I remember when they brought it all down. I also remember a huge turtle being found in there. The picture at the top of this page is what used to be a mental hospital and is up on Belmont Street just before U Mass and is near the area of the WAARC Camp Joy is. My siblings and I used to go to Sacred Heart in the early 70's. On I-290, we could see prisoners looking out their cell windows. Not much of a view. A couple of years later, my friends and I went into the abandoned jail and viewed the cells (and smashed a few things in the warden's residence). Pretty dank, dirty, and depressing. Stay out of trouble. Jackie Rudy, yes I'm who you say I am. Anyway, I did respond to your e-mail. I miss the old village... Remember the 4 of July bon-fires on the old jail property? Alton, this is Mark Sullivan. I do remember the bonfires: particularly the bonfire of 76. Remember the big tree was also lit? And tires were placed on fire on the hydrants so the firemen couldn't put it out? I too miss the fun times we all had at the village. A family member recently turned up an 1880 census showing that my great-great grandfather was a prisoner at this jail, at 116 Summer St. I would love to find out what he was "in" for. Would any one have advice on where records from this era might be found? To S. Shaw, City if Worcester had good records from 1848 to today. The thousands of records are not on the internet. But if you are willing to spent $ for a specific record the city may be able to help. Call them (the city), if you are serious about a single record, otherwise maybe someone at this site has access to city records (doubt access not to anyone, suspect access other to city employees). Does anyone know where I can find info about when Worcester had a volunteer police dept/team? Thanks! my great grandmother said the cop on foot patrol use to sneak up on her porch and sleep in the hammock and she never told a soul she didnot want to lose the protection by the risk of him sleeping elsewhere it was in worcester in the early twenties she was born in 1890 in greendale ma. WHAT WAS THE RESTAURANT CALLED BEFORE IT WAS THE AKU AKU? June: Before it was the Aku-Aku, it was Vallee's (Steakhouse). When I saw your name posted here, it brought back a lot of pain. Why did you reject me? I have discovered my grandmother was an inmate there in 1930. Shocker!!! Does anyone know how to find a register that might reveal inmates' crimes??? I remember the old jail. I lived right across the street in Plumley Village. I remember when they tore that down and the Bonfires that Mark Sullivan and Alton Drake were talking about. I lived in the same building you did Jackie Rudy just above you as a matter of fact. Mark Sullivan you use to trade me old wrestling magazines for Bubs Daddy's all of the time. Ah the memories. I also remember after it was torn down the carnival use to set up there before the restaurant was built. There was a tree in there that had a branch that the bigger kids would bend down to the ground and get some unsuspecting kid to grab onto it(me) and then let it go for a ride of a lifetime or at least it seemed that way back then. Thanks for the memories they were great. Does anyone remember the 2 1966 Cadillac ambulances stationed at the Waldo Street police headquarters. The Worcester Police ran the ambulance service in those days.